We thank you and your very capable guys for the wonderful job you did restoring our kitchen at Terrapin Apartments, Noosaville. The installation went very smoothly and was stress free. The reliability and quality of the work was most impressive. Many thanks once again. These before and after photos tell the story. We're very pleased with our renovated kitchen and two bathrooms so I write to say thanks for the efforts of you and your people. The process of renovation is demanding isn't it. Everyday brings new adventures with different people doing different things. We shape our lives around their work. The house is covered in dust for weeks. Your people are to be commended for their politeness, their punctuality and their consideration of our requirements. They always left the house clean afterwards. We are grateful for the involvement of Adam, Tim, Jason, John, Simon, Chris, Mark and the guys who fitted the glass in the showers. 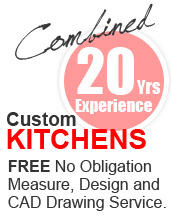 They all did good work and they are a credit to Custom Kitchens. And thanks to you Lynden. Your speedy responses, your eagerness and your friendly nature make it easier to put up with the inconveniences. Congratulations to Katherine for her accounting work; it is professional and a tribute to your company. Benita joins me in saying thanks and wishing you the best of luck for the future. She says we are delighted! I would like to say thank you for your inspiration and co-operation in carrying out what has been a huge change to half our house. Nothing has ever been too much effort for you or your tradesmen. Your suggestions have been welcomed while the trade work has been so professionally finished.